Malcolm Turnbull wants a Royal Commission up and running by September. 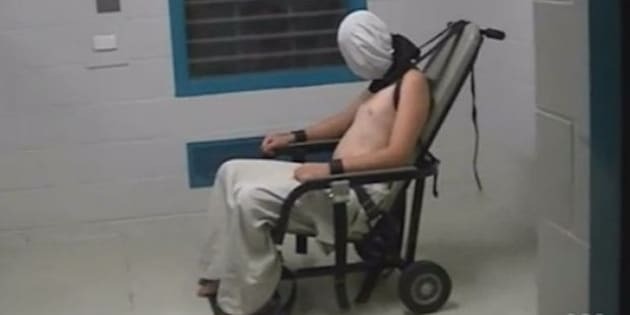 Northern Territory authorities have denied having prior knowledge of footage showing the abuse of children at an Northern Territory juvenile facility, as the lawyer for a boy shown strapped to a chair with a hood over his face demand the immediate release of youths in solitary confinement. Prime Minister Malcolm Turnbull declared he has confidence in NT Chief Minister Adam Giles and told the press he expected a Royal Commission to get under way by September. On Monday night the ABC's Four Corners program aired shocking footage children as young as 10 being tear gassed, shackled, stripped and -- in the words of the Northern Territory Children's Commissioner at the time -- "tortured" inside the Don Dale centre in Darwin. "We're going to get on with this, we're going to get to the bottom of it quickly ask with the aim of producing -- quickly and with the aim of producing a report setting out all of the facts early next year," Turnbull said. He said the events were not know to him until he saw the Four Corners episode. Peter O'Brien, a solicitor representing Dylan Voller and 16-year-old Jake Roper has demanded his client's release from jail. Voller, now 18, was shown in the 4 Corners footage being strapped into a restraint chair before being left with a hood over his face. "He must be released immediately," O'Brien said in a statement. "The impact of these years of brutalisation must be immediately measured and he needs immediate assistance. "Any child locked up in solitary confinement in the Northern Territory need to be released immediately." Reports of children being gassed at the centre were first revealed in September last year. The PM was asked how he could say he wasn't aware of the reports, or that Australians weren't aware. "We will investigate what has happened in the youth detention system in the Northern Territory that is the critical thing to do," Turnbull said. "We're taking action right now. Getting on with the job that Australians expect us to do to get to the bottom of it." Turnbull said he had confidence in Giles, but the chief minister needed the confidence of the Northern Territory people. "I discussed it with him last night in fact and early this morning and he is as committed as I am to there being a rigorous inquiry and investigation and that inquiry, that Royal Commission, may well throw up evidence about the extent to which the Government was aware of events or not," Turnbull said. In the NT, chief Minister Giles said the Monday night was the first time he had seen footage of the abuse. On Tuesday he removed John Elferink as NT Corrections Minister to take on the role himself. "What came up last night was new information that I understand that both the police nor Attorneys-General had been aware of in the past and that's why they're referring it again," Giles said. Elferink is also Minister for Children and Families, among other portfolios including Attorney-General. Giles was asked if Elferink was complicit or incompetent by not asking to see the videos when allegations were first raised last year. "I have been quite confident that John's been working tirelessly to improve the corrections system in the Territory" Giles said. When asked by a reporter if strapping a child into a chair -- as was shown in the 4 Corners footage -- was OK he replied: "We're going to have a look at that as part of the Royal Commission. We will have a review into that. I can't talk about individual cases." "Prison officers need the ability to be able to de-escalate issues when children are not in a feeling of a calm environment within themselves and at all times those kids' wellbeing is being put at the best possible place," he said. "Having said that, there is certainly footage last night... where I don't think the standards have been appropriately upheld." Giles said there was a culture of cover-up within the corrections system. Aboriginal and Torres Strait Islander Social Justice Commissioner Mick Gooda on Tuesday praised the Prime Minister for promptly calling the inquiry. He also questioned the role of the NT government and expressed the hope the commission would be extended across Australia. "I support the concept of a royal commission," he said. "I think it's got to go wider than just Don Dale. We've got to work out why 90 per cent of those kids in prison up there are Aboriginal."